Though the U.S. housing market is inching closer to its eventual bottom, the country is still three to five years away from a normal housing market with healthy price appreciation, according to a November home prices report released today by Zillow.com that also detailed the state of the South Florida housing market. The report showed that prices increased in South Florida by 0.1 percent compared to October 2011, reaching $137,000. That is still well below the national average home price, which declined 0.5 percent month-over-month to $147,800. Year-over-year South Florida home prices declined by 3.9 percent from November 2010 and they now stand 55.4 percent below their peak. Nearly 45 percent of November home sellers in the region suffered a loss on their sale. 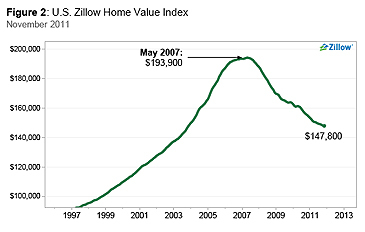 Nationally, prices fell 4.6 percent in the last year, and are now 23.8 percent below their peak levels. Further, 35 percent of re-sold homes traded at a loss. Zillow.com said that the general flat-lining of prices is a sign that the bottom is near, and improving economic indicators — such as the addition of 200,000 jobs in December, stronger holiday retail sales and improving consumer confidence — support that conclusion. Nevertheless, demand will not put healthy upward pressure on prices until the glut of foreclosed properties works its way through the pipeline. Thanks to the robo-signing controversy, the liquidation rate has decreased to just 8.1 out over every 10,000 homes from the 11 recorded just before the crackdown began in October 2010. As a result, though home prices may bottom and even slowly increase by 2013, they won’t appreciate at normal levels until at least 2014, Zillow.com said.